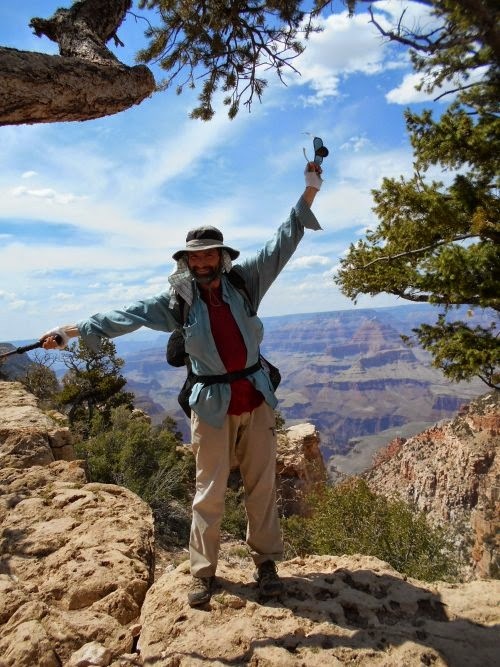 Another Long Walk: Day 46: Grand Canyon... here I come! 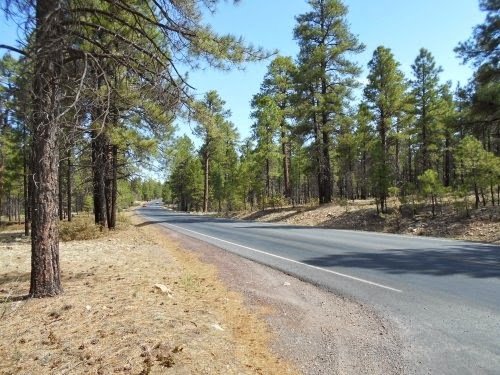 May 28: The Arizona Trail passes near the small tourist town of Tusayan, but I skipped it completely in my eagerness to reach the Grand Canyon. 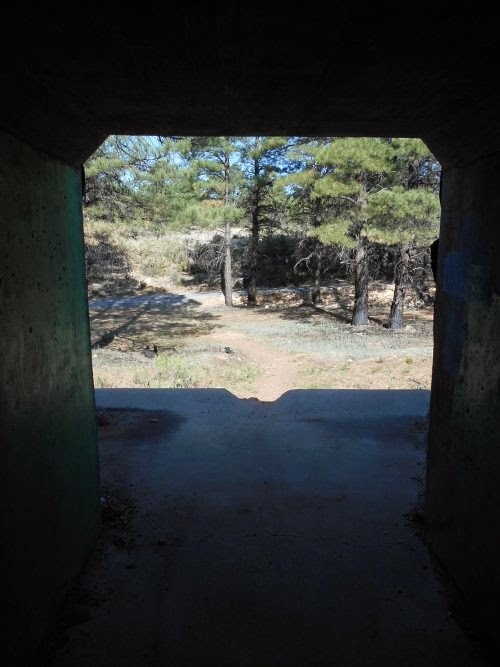 The trail entered the park just west of the road entrance--in a kind of a secret entrance for people on foot or mountain bikes. 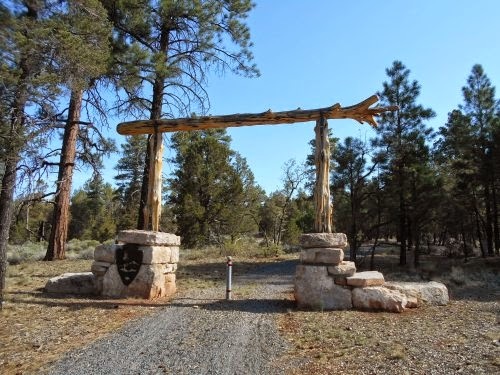 As far as I know, the park service doesn't really promote it and most people don't even know it exists, but if you enter the park through it, you miss the entrance gates and don't have to pay any fees. 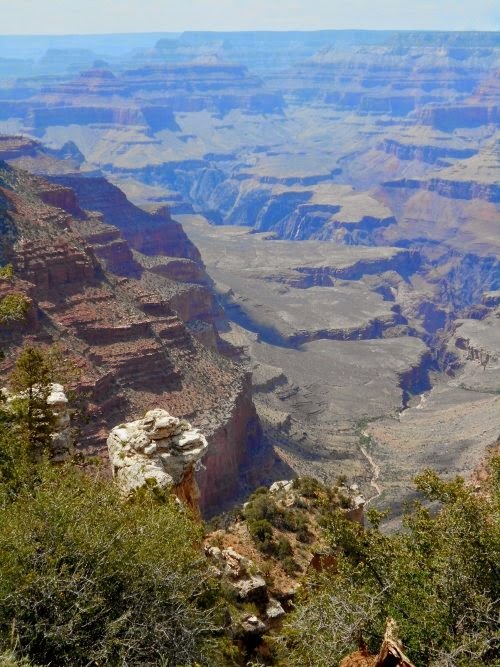 The catch, however, is that you're still several miles away from the populated areas of the Grand Canyon and even further away from the actual views. I might have gotten into the park for free, but I had to earn my way to the viewpoints by hiking there. Before the views, though, I had an important task that I really needed to take care of: permits. I needed a permit to camp in the Grand Canyon. 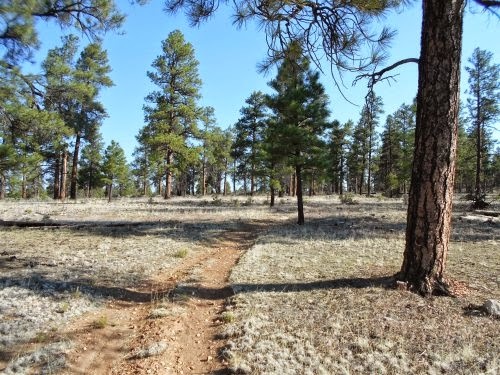 The Arizona Trail approached to within about a quarter-mile of Mather Campground, so I got off the trail where I thought it would be. The South Rim of the Grand Canyon is well-connected with shuttles and I knew that there was supposed to be a shuttle stop at the campground. My intention was to jump on the free shuttle to get to the backcountry office where I could get a permit, then jump on the shuttle and return to where I left the trail. Any shuttle stop would do, but the one at Mather Campground was the one that seemed closest to the trail. That was the plan. Unfortunately, I had trouble figuring out where the bus stop was located. My topo maps didn't really show that information. I started following a street in vaguely the right direction--the street signs said it led to the Market Plaza. I didn't want to walk all that way, but if push came to shove, eventually I'd reach a bus stop. Along the way, I picked up more plastic bags that had gotten caught on trees and brush. That was the only kind of trash I saw, and once again I decided that plastic bag bans were a good idea. 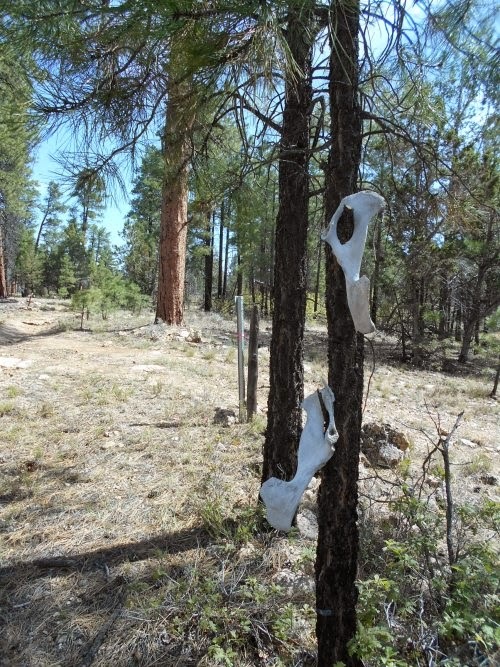 The Grand Canyon shouldn't be littered with plastic bags. I was about to cross a street when I took another look at my map, trying to figure out if I was headed in the best direction, when I saw a ranger pull up at the intersection and he asked if he could help me. "Do I look that lost?" I asked him, a little amused. around the town in the morning. He didn't seem at all people shy! "Well, it seemed like you were looking at that map a lot." 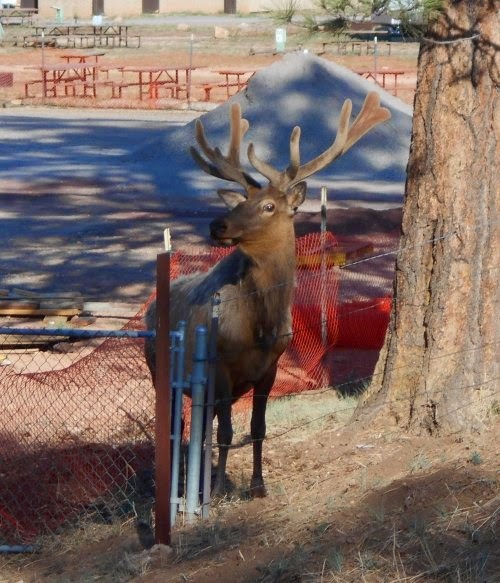 So I told him I had hiked in on the Arizona Trail and wanted to get to the backcountry office to get a permit. "Wow--you're totally in the wrong area for that!" "I know that...." I said, mockingly shaking my finger in frustration, "but I'm trying to find a shuttle stop that would take me there. Any shuttle stop would do! But there doesn't appear to be any around here." The ranger went on about that being a good idea--everyone should be using the shuttles because they're so much faster and easier than trying to find parking places around the park. "So where's the nearest bus stop?" I asked. "Hop on in--I'll drive you over to the backcountry information center." Sweet! I jumped into the passenger side of the truck and off we went. It didn't take more than about 5 minutes to get there, and I thanked the ranger (Thanks, Ranger Pat!) for the ride and hopped on out. 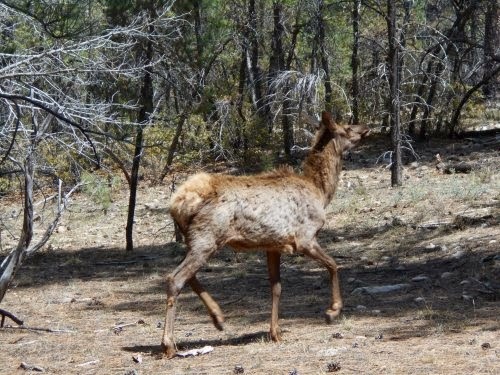 So I asked him if I could get a permit to camp at the Cottonwood Campground--about 14 miles from the South Rim and I figured a good place to stop for a very short day where I could thoroughly enjoy hiking through the inner gorge. I wanted to camp there the next night, but he told me that campground was full, but that he had one site available at the Bright Angel Campground. Coming out from the Bright Angel Campground, I wasn't sure if I'd make it out of the national park by the end of the next day--it was about 24 miles to the northern border from the campground and almost all uphill from the very bottom of the canyon, so I added a second night of camping in section NB9. "Just get a few miles past the top of the North Rim and you can pretty much set up camp anywhere you want after that," the ranger told me. "That whole area is in NB9 all the way to the north boundary." Hey, works for me! I really liked the fact that I wouldn't be stuck in a campground crowded in with perhaps hundreds of other people. There wasn't any way to avoid that in the canyon itself--camping was only allowed in designated campsites in the canyon--but outside of the gorge and away from the immediate rim had open-ended and much more flexible camping options. "You're lucky you got that site at the Bright Angel Campground," the ranger told me. "It's usually full." 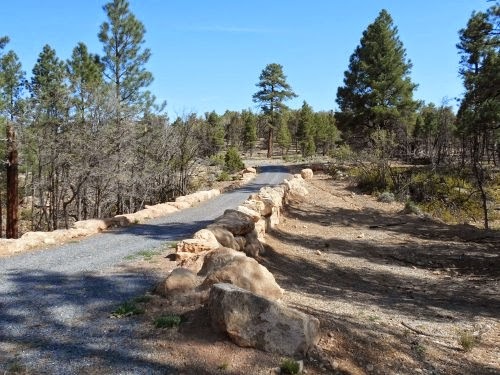 For tonight, the ranger suggested that I camp at Mather Campground--they had a section for hikers and bikers that pretty much always had space available, but he only handled the backcountry permits and that didn't include Mather Campground. I'd have to go to the campground and check-in there. 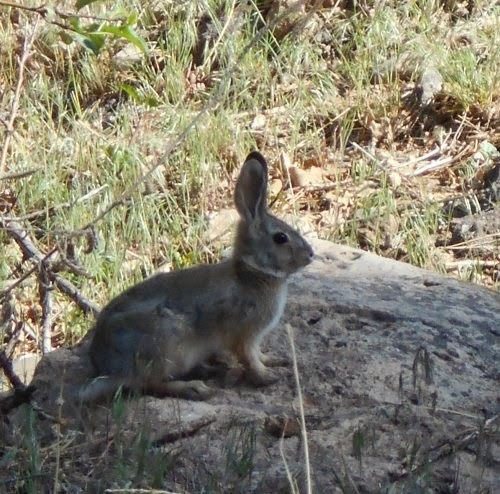 I did take the shuttle bus back to Mather Campground, though, since that's where I got off the Arizona Trail. Before getting back onto the trail, however, I stopped at the campground long enough to do laundry and take a shower since both were available there. I also found a bank of payphones and made some calls to update everyone on my progress. "I've made it to the Grand Canyon!" I shouted into the phone. "And tomorrow night, I'll be camping at the bottom of it!" 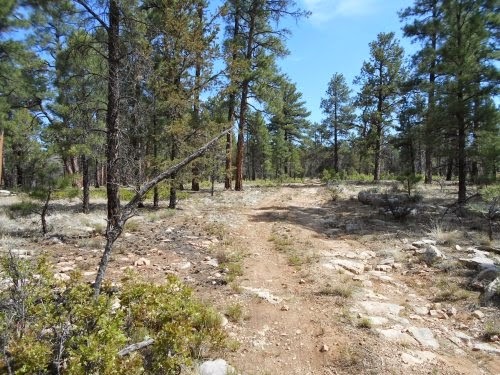 I also filled up with water, then walked through to the back of the campground, hiked cross-country to the road I had found myself on earlier, then reconnected with the trail where I had left it a couple of hours earlier. By now, I had figured out why I had so much trouble finding the bus stop--I had to walk cross-country to reach it and had assumed that there was a trail or road that led to it. 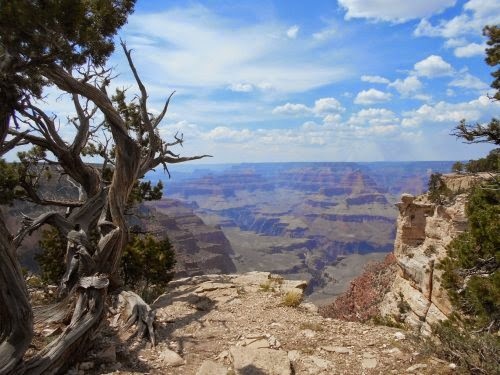 Once I was back on the Arizona Trail, I continued hiking on to the canyon's rim. I wanted to get as far as I could today before I stopped, and that was right up to the rim. of the Grand Canyon--here by Tusayan. The Arizona Trail reaches the rim near the South Kaibab Trail, then overlaps that trail all the way to the bottom of the canyon. I could hike out as far as the South Kaibab trailhead, then catch a shuttle bus from there back into the populated places of the park, which is exactly what I did. Then I changed to the purple line which is the shuttle bus that takes me out of the park to Tusayan--the trail town I passed up earlier in the morning. I got on that bus, and soon learned that the man driving it was driving it for the first time. He drove other shuttle buses in the park, but this was his first time running the purple line and he was quite entertaining to talk with. He asked the previous driver that was just getting off if she had any suggestions. "Keep the rubber-side down," she told me, "And don't crash into any other vehicles." Before the bus got going, the new driver found a stamp and asked if anyone needed their hand stamped. I wasn't entirely sure how these bus systems worked, but I was a little concerned about leaving the park on one. Could I get back in? It made sense that I should be able to get back in, but I couldn't imagine the bus pulling over for everyone on it to pay an entrance fee every time it entered the park either. And anyhow, I really didn't want to pay an entrance fee. 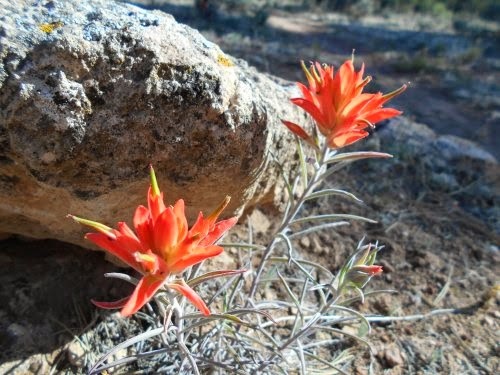 Arizona Trail thru-hikers aren't supposed to pay an entrance fee! So when he pulled out that stamp asking if anyone needed it, I figured *I* needed it. "I need this to get back into the park?" I asked. "Stamp me up!" He stamped the back of my hand with a red stamp, but I couldn't really make out what the image on it. I talked with the driver for the 20 minute drive into Tusayan, telling him where the Arizona Trail crossed the road in two different places. (In one case, where it went under the road through a culvert.) He seemed excited to be driving at 40 miles per hour because it was double the fastest speed that any of the other buses could travel on the roads throughout the Grand Canyon. "Look at how fast we're moving!" he'd call out with glee. I had agree--I was used to moving at 3 miles per hour. This 40 mile-per-hour stuff was indeed quite fast! The bus covered the same distance in 20 minutes that took me hours to hike earlier in the day! We finally arrived in Tusayan and I got off the bus. My first stop was Wendy's, which was practically right next door to where he dropped me off and I felt like some fast food. Greasy and filled with calories. Lots of calories. The movie had some very dramatic videos of the Grand Canyon, but as all things do, it too came to an end and I wandered outside as sunset was fast approaching. It was time to find somewhere to camp for the night. 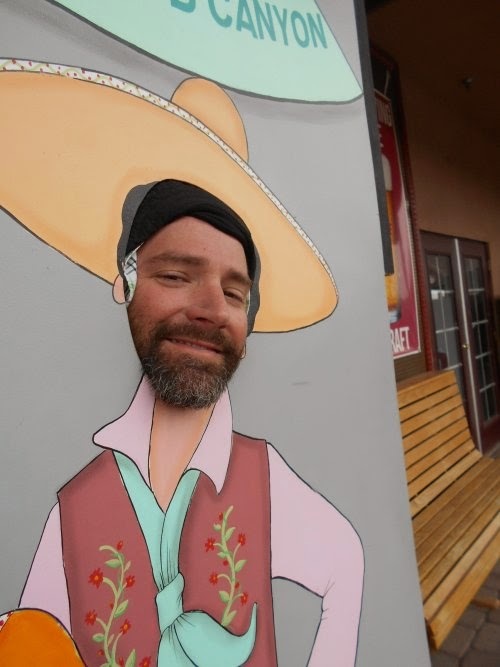 I had looked into getting a hotel room for the night in Tusayan, but the very cheapest rooms I could find cost over $150/night--far outside of my budget! No, not when I could camp for free. Anyhow, I already got a shower and laundered my clothes. There wasn't much I needed with a hotel room anymore. 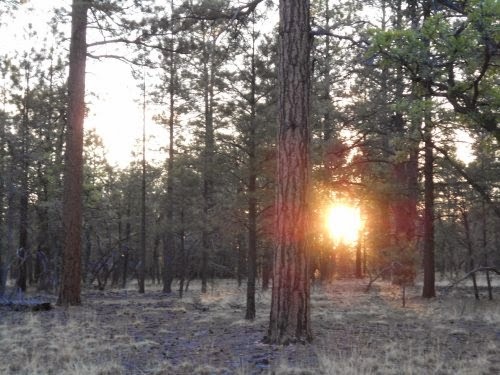 I walked about a half-mile east of town, hooking up with the Arizona Trail and setting up camp alongside of it. 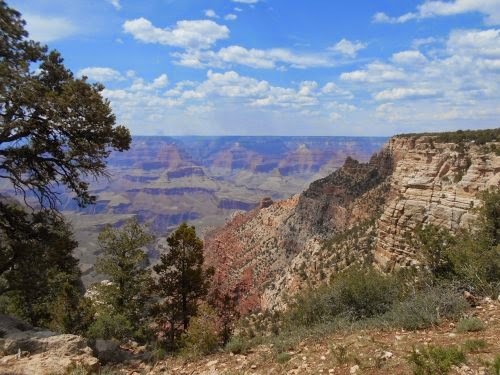 I knew that I could probably have stealth camped illegally in the Grand Canyon somewhere--up until the Arizona Trail reached the rim, the trail veered largely around the populated areas of the park and in the woods. It would have been easy to set up camp illegally along it and no one would have been none the wiser, but it was just as easy to jump on the free bus out of the park and camp legally outside of Tusayan, so that's what I did. sunlight so I could get a good photo of it! 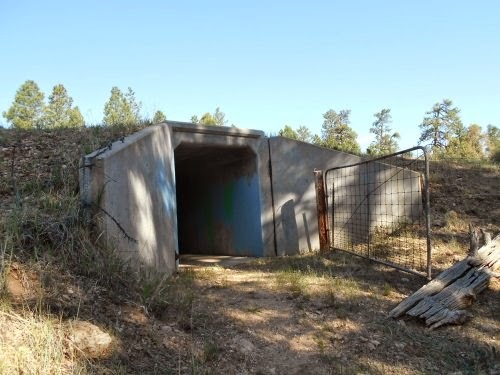 The secret entrance to the Grand Canyon--for hikers and bikers only! The second time I crossed Highway 64--but this time, on its surface. There wasn't any culvert or drainage ditch to go under here. This looks like a warning of some sort....? of it is just trees and forest like this. 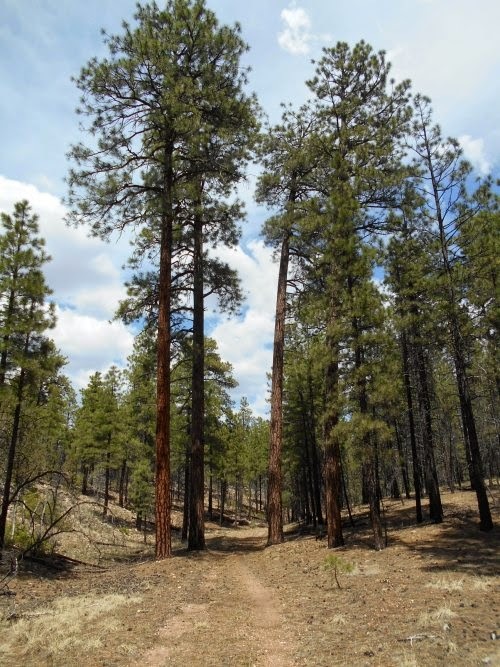 I heard that Northern Arizona has the largest ponderosa pine forest in the country. some remarkably tall trees too! scared of me anymore. This fellow just trotted on by like I wasn't even there. And finally--I've reached the South Rim of the Grand Canyon! Your rabbit looks like it is wearing a collar. Wonderful blog! You would enjoy the book Death in the Grand Canyon. Fascinating read!